FILE - German special police leave a house in Berlin Nov. 15, 2016. German police launched dawn raids on mosques, apartments and offices in 10 German states, and the government banned a group it accused of trying to recruit fighters for Islamic State, the interior ministry said. They left their homes by the thousands, multiple waves of supporters and would-be foreign fighters who abandoned lives of relative comfort in the West to fight in Iraq and Syria — the majority ultimately aligning with the Islamic State terror group. Now, with IS's self-declared caliphate in tatters, new studies are painting a complex picture of the threat the survivors pose to their home countries. And it runs contrary to what many Western intelligence officials first feared. "It does not appear that returned foreign fighters represent the large-scale threat to Europe that was envisioned," concludes a report issued this month by the Egmont Institute, a Brussels think tank that looked at the dangers posed by 500 fighters from Belgium, Germany and the Netherlands who have already returned. "There are unlikely to be mass numbers of foreign fighters who launch major attacks," the report said. "If there were, hundreds or thousands of returnees from Syria would have already made the attempts." A new U.S. study, by George Washington University's Program on Extremism, reached a similar conclusion. "The risk of returned travelers being engaged in terrorist attacks has, to date, been limited," according to the study's authors. "There is currently no publicly available evidence to suggest that American travelers have slipped into the country without the knowledge of authorities," they wrote. "Homegrown extremists currently appear to be more likely to commit domestic jihadist attacks than returning travelers." In all, U.S. intelligence officials estimated that of the more than 40,000 foreign fighters who traveled to Syria and Iraq, only 5,000 to 6,000 came from Western countries, and only a small fraction of those were from the United States. The exact number who successfully left from the U.S. is unclear. 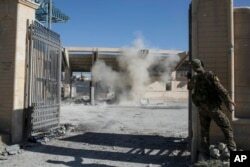 Officials have said only about 250 to 300 U.S.-based people left or tried to leave to join groups fighting in Syria. The George Washington University study, a multiyear effort, found that at least 50 would-be travelers from the U.S. never made it, having been arrested before they were able to exit the country. Of the remaining 200 or so who left or tried to leave the U.S., the study identified 64 so-called travelers who fought or otherwise supported Islamic State, al-Qaida and other groups in Syria and Iraq. 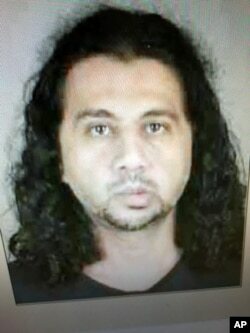 FILE - Arafat Nagi is shown in a 2013 arrest file photo provided by the Lackawanna (N.Y.) Police Department. He pleaded guilty Jan. 22, 2018, to a charge of attempting to provide material support and resources to a foreign terrorist organization. Only 12 of those travelers are known to have returned, the study said. Nine of them have been arrested and charged with terror-related crimes. Twenty-two are thought to have died in Syria or Iraq. And the whereabouts of another 28 are unconfirmed. None has successfully carried out an attack in the United States, the study said, with the lone plot stopped after the returned traveler was arrested early in his planning. Europe has not been as fortunate, where returning foreign fighters have successfully carried out attacks, starting with the May 2014 shooting at a Jewish museum in Brussels by French-Algerian foreign fighter Mehdi Nemmouche. But since the November 2015 attack in Paris and the March 2016 attack on Brussels, the involvement of returning foreign fighters in terror attacks on European soil appears to have dissipated. The findings, by both George Washington University and the Egmont Institute, are a far cry from warnings issued by top U.S. intelligence and counterterrorism officials less than two years ago, when many warned of an inevitable "terrorist diaspora" that would follow the fall of IS in Syria and Iraq. "Those thousands of fighters are going to go someplace," James Comey, the former director of the U.S. Federal Bureau of Investigation (FBI), told lawmakers at the time. "Our job is to spot them and stop them before they come to the United States to harm innocent people." Yet over the past several months, U.S. and European officials have modified their expectations, agreeing the exodus they once feared has failed to materialize. Instead, they have increasingly worried about the capabilities of the returning fighters, especially those who saw action on the battlefield and who remain committed to jihad. "The quality of the fighters after the experience on the ground in Iraq and Syria is something we're paying very close attention to," one U.S. counterterrorism official told VOA. Others have described these few returning foreign fighters as force-multipliers, capable of having a disproportionate effect. And they worry, in particular, about the Islamic State terror group, which has proven especially adept at maintaining lines of communication, even as its self-declared caliphate has collapsed. As recently as October, some European intelligence officials described IS's planning and communication wings as "very active," despite the fall of both its Iraqi capital of Mosul and its Syrian capital of Raqqa. The Egmont Institute study warned that even after IS itself fades or morphs into something else, the relationships that have facilitated such communication could prove troublesome. "Human connections that were established in Syria and Iraq will define jihadi networks for the coming decades," the study concluded. "European intelligence services will have to sustain their surveillance of those FTF [foreign terrorist fighters] remaining abroad [in the Middle East, Africa or Asia]." Experts see other reasons to worry, as well, including the impact some of these foreign fighters can have on their home countries even from afar. "These people who successfully make it into Iraq and Syria and join a foreign terrorist organization, they often do become the recruiters," said Mary McCord, a former acting assistant attorney general at the U.S. Justice Department's national security division. "They are also oftentimes the ones who are going to reach out to people here in the U.S. and in Western Europe and in other countries and encourage homegrown attacks," McCord said. And there are questions about what will happen with travelers or foreign fighters who return only to spend time in prison as many of them will eventually be freed. Seamus Hughes, deputy director of George Washington University's Program on Extremism and a co-author of the GWU report, said the average prison sentence for those who traveled from the U.S. to take part in the fight in Syria and Iraq is only 10 years, shorter than the average prison terms handed out to would-be U.S.-based jihadists who were arrested at airports. Hughes and his co-authors worry that the lack of deradicalization or disengagement programs could allow for problems in the future. "If left unaddressed, returnees can augment jihadist networks in the U.S., provide others with knowledge about how to travel and conduct attacks, and serve as nodes in future jihadist recruitment," they wrote.